How do you get the best shelf life for your batteries? What does it take to optimise battery life times? Valve-regulated lead-acid battery (VRLA) batteries typically have a design life that ranges from 3 to 12 years. All lead acid batteries are destined to fail, and this will often happen long before the full term of the design life. This is known as service life. The service lives of lead acid batteries are influenced by many factors such as temperature, overcharging, undercharging, material degradation, inadequate maintenance and more. Poorly maintained batteries can fail in less than half the term of the design life. When this happens, businesses are not fully realizing the value they have invested in their battery assets – in addition to being exposed to the risk of mains power outages. It only takes the failure of one battery to compromise the entire battery string. Unknown and undetected battery failures become apparent right at the time when you need the batteries the most – during a mains power outage. PowerShield battery management systems maintain the integrity of the battery system by detecting failing batteries before they affect the performance of the whole system. The effectiveness of a battery management system is proportional to the number of points that are monitored and the frequency that this occurs. With regular monitoring comes the accumulation of data, the ability to report and spot trends, and the ability to take timely remedial action. 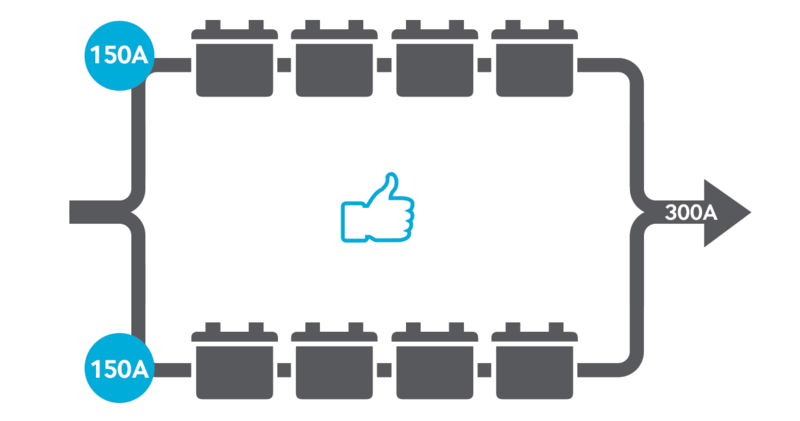 When your battery assets are actively managed in this way, the service lifetimes can be optimized and extended to get closer to the design life. The benefits of a PowerShield battery management system extend beyond making sure your stand-by batteries are actually standing by. PowerShield battery management also helps you to better manage the total cost of ownership of your battery assets. In a healthy battery system, the current is balanced. In the left of the two illustrations below we see two strings of four batteries each. In a healthy condition each string has 150A current flowing. What happens if there is a connection problem or a high impedance battery in a string, as shown in the right illustration above? The healthy string has to do the work for both strings, this will result in a much shorter backup time. This is because the weakest battery in the string dictates the current capability of the whole string. Even though there are three healthy batteries in the string the energy of those three batteries cannot be retrieved due to the one problem battery limiting the current. A worst-case scenario is that there is a bad battery in each string and the load will be dropped in a matter of seconds when a longer period is needed. You can identify problem batteries and avoid the potential consequences of battery failure with PowerShield continuous battery management. 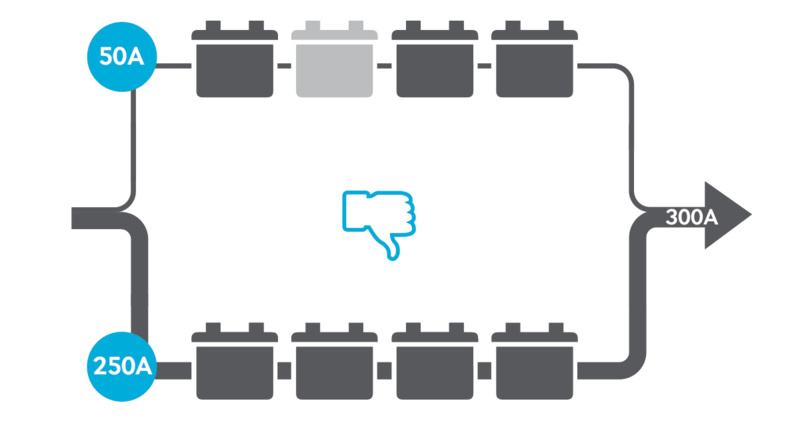 Check out our blog to learn more about the challenges of managing lead acid batteries.